"Hi Jit ! Saw your caricatures, really impressive. 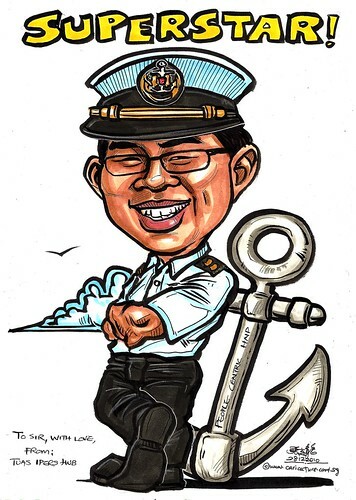 Would like to request for a caricature of my boss in ink and colour marker...... My specs: - prefer in A5 - in ink and colour marker - with the words: 'Superstar' (placed just above the caricature, to denote him) and to have a sign-off with the words, 'To Sir, with Love, from Tuas iPers Hub' which can be in the bottom right or left corner. - maybe can draw him as a naval officer with peak cap and leaning on an anchor? Anchor to have the words: 'People centric HNP'"
Urgent job. One day delivery, with framing.